When Nova asked me to take part in this blog series, I enthusiastically replied sure. I love her blog; I love her; and was honored to be asked. I knew what I’d write about right away: 2009. I’d figure out the details later. Then I sat down to write and nothing happened. I knew 2009 was a big year for me, but nothing stood out. The thing is, my whole life has been nothing but turning points. I use a less polite term, though, and call them WTF moments. I’ve been hit with them regularly, so often that I can’t tell you a defining moment in my career. I have a lot of them. It may seem disingenuous to say that: that nothing truly defining has happened or that I am devaluing the things that have. Not so. Simply, it is only in hindsight that we see the weight a moment has. Every day we make infinite choices, most small—bagel or cupcake for breakfast? That one turns out 50/50—but some big. And every day, things that don’t seem like choices turn out to be. Everything that happens to us can break us if we let it. But what, really, does that look like? We could quit. We could shrivel or avoid. But in the end, we typically keep going. One foot in front of the other. We cope, is what we do, even if for a time we quit or shrivel or avoid. We still keep going, sometimes in a new direction, sometimes straight ahead. Because the only other alternative isn’t something most people really contemplate. So even the act of coping, of choosing to be, has the potential to be a turning point. We talk all the time in writing about stakes and arc. In our daily lives, we don’t. But they exist. The ultimate stake is usually life. In daily life we don’t barter with that. 2009 was a very hard year for me. By October, I was working a full-time office job I hated—I am allergic to office jobs. I was married and sinking under the weight of it. I hadn’t finished a novel yet that year. (I had written five manuscripts between November 2005 and November 2008.) I was already struggling with depression, and my inability to write was compounding my personal life issues. I was broken. I woke up one Friday with a choice clear in my head: I could stop. I could dress for my job downtown and then step in front of the train, or I could keep going. I could go to the hospital. I don’t remember making that decision, only knocking on my neighbor’s door and asking for the ride. That moment doesn’t seem like a turning point, does it? Keeping going isn’t changing direction, really, but when your options are to end the line or not, it’s a very big decision. I spent a week on the psych ward, and you can read more about that on my blog here and here. While I was there, I decided that for my own health I would stop trying to work in an office. I was going to be a writer, full-time, and make a real go of it. Ironically, I lost my office job while I was hospitalized, so it’s a good thing that had been the plan anyway. By the new year, I had completed a draft of a women’s fiction novel, something I had always wanted to write but never did. I’m primarily speculative fiction, and usually YA at that. But getting out of the hospital released me in more ways than one: I wrote SAoG quickly without censoring anything, without worrying about if it was good or bad or readable. I wrote to prove myself to myself. I wasn’t broken. I wasn’t crazy. I was capable. I’d made the choice to live, so I was going to damn well do that. And that meant writing. I set SAoG aside with minimal revision because I knew I didn’t want to pursue women’s fiction. I wrote a new book and revised it, and while querying that one, I started After You. I got an agent in November 2010, just over a year after my hospitalization, and in November 2011, I got my first advance check for its sale to Penguin. I no longer work in an office. I’m no longer married. But I will always write. Because sometimes choosing yes is its own defining moment. Jessica Corra believes in magic, chocolate cake, love, vodka, and books. Her YA magical realism, After You, comes out in Spring 2013 from Penguin. She currently lives in Philadelphia, where she holds sundry odd jobs and does a lot of baking. Find her at her website, where she talks a lot about identity and authenticity, or on Twitter, where she is much goofier. You know how they say, “Don’t quit your day job”? Well, that was my turning point. Quitting my day job. For most of my life, writing was something I fit in between the “real” things I was doing. It was also something I never told anyone about. Writing always seemed like a secret part of me, an impractical daydream—not something to be ashamed of, exactly, but something that would lead to people asking me questions that I didn’t know how to answer. My family and friends knew, but many of them didn’t really know how important it was to me. Even after I sold a few short stories, I let everyone think that writing was a minor hobby. Also, I knew enough about writing to know that it wasn’t the kind of career that typically provides a regular, steady income. My parents, who both grew up poor, were very firm on the importance of a regular, steady income. So in college, I majored in biology and minored in journalism, and then—when I realized that I couldn’t do lab work and didn’t want to be a journalist—I went to law school. Law school was somewhat more intense than college, but I still found time for writing. My first story to place in the Writers of the Future Contest was written during a class called “Foundation of the Regulatory State.” And the first few chapters of Mistwood were written on the subway. Then I went to work at a large law firm… and it stopped working out. When you become an associate at a large NYC firm, your time is pretty much theirs. The only time I had to write was on my morning commute to work; pretty much every minute from the time that I got to the office until I went to bed at night was taken up by work or necessary life things. I had a box next to computer filled with random scenes of Mistwood I had written on the train, waiting to be typed into the computer and formed into a comprehensible manuscript. That box sat there, getting fuller and fuller, for two years. I decided quickly that once I had built up enough savings, I was going to quit. But as I continued working, that goal began to seem more and more distant. I was spending almost every waking hour concentrating on my legal career and surrounded by people who were doing the same. Quitting law entirely started to look to me the way it would look to most of the people I knew: like a flakey and weird move. Like I had failed. I started to look for more reasonable reasons to quit. I took the GREs and applied to graduate programs in history. I looked for ways to do legal work on a freelance basis. I started seriously dating a guy who lived in Boston (okay, that wasn’t entirely just to find an excuse). But what finally gave me the impetus was the growing realization that I was going to marry this guy who lived in Boston, and that pretty soon afterward we would probably have kids. I wanted to have kids, but I also knew that once I did, it would be approximately 18 years before I could do anything full-time again. This was my window of opportunity, and it was closing. So I did it. I quit. Surprisingly (or maybe not), the reactions of my fellow lawyers were more positive than I had anticipated. One or two clearly thought I had actually been secretly fired, but most of them seemed to sincerely admire me for following my dream. I had saved assiduously while I was working, so I had enough savings to keep me going for a little while. I gave birth to my daughter about a year and a half after getting married, so my period of full-time writing passed without any milestone that could make me say it was worth it. But during that time I joined a critique group; polished a manuscript; made connections with editors who liked that manuscript; finished and polished a different, adult manuscript; submitted Manuscript #2 to agents; and got summarily rejected by all the agents. So when I went back to being a part-time writer, I was in a good position for the next steps: figuring out that Manuscript #2 was actually a young adult manuscript and sending it to all those editors who had really liked Manuscript #1. That might seem like the moment when my decision to quit proved worth it. And it’s true that my dream—the gold at the end of the rainbow—was always to publish a real book, and I hope I never stop being happy that I achieved it. But the truth is that even if I still wasn’t published, quitting would have been worth it. When my first book was published, I became an author. Four years before that, however, I decided to publicly declare myself a writer. In many ways, that first turning point was the more important of the two. Leah Cypess used to be a practicing attorney in New York and is now a full-time writer in Boston. She much prefers her current situation. She is the author of Mistwood and Nightspell, young adult fantasies published by Greenwillow Books (HarperCollins), as well as of numerous short stories. Visit her online at www.leahcypess.com. Congrats, Vivien! Thank you to everyone who entered—and to the author for the prize. I’d planned to blog today, and that blog was meant to be about my first writing love—literary fiction for adults, which I aspired to write since college—and how dreams shift and balloon and curl back in on themselves, and how dreams expand and take on new faces, and how your dreams change as you grow and change. But then I began thinking about the book I did write, the book that led me away from my original dream into a new dream. This was Imaginary Girls. Last night, in the aftermath of a mini identity crisis, E and I were talking, in the way we do, about my future as an author. He’s just as invested as I am in this, and he knows all of what I want to do, can do, could do, might do, and wish to do. 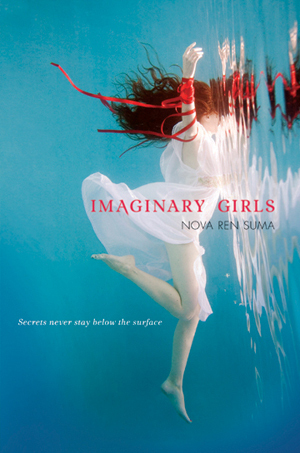 We talked about how Imaginary Girls turned out—the book I wrote. It doesn’t matter who the audience was meant to be, before or after or during. Would I have written a single word differently? And the answer is no: That book is exactly how I want it to be, how I meant it to be. I was true to my characters. I was true to my intention. True to my love for my sister. True to myself. 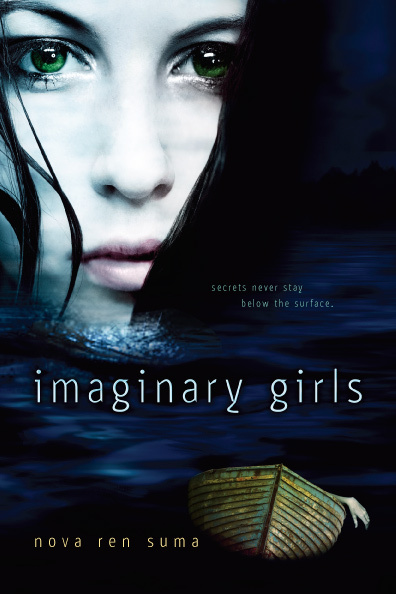 Imaginary Girls is the book of my heart. I encourage you to read her post, if you’ve written the book of your heart years ago, or if you’re writing the book of your heart today. Even if you haven’t found the book of your heart yet and you wonder where it might be. And if you’ve written the book of your heart already and have seen in published, I encourage you to read the comment on that post from Jo Knowles. I wrote my first book at 23. Bursting with youthful confidence, I scribbled an outline for a middle-grade story on a backpacking adventure around Europe. I came home, took off my hiking boots, blasted out 30,000 words, polished it up, and sent it off to a couple of agents. Within a few months I had signed with a local literary agent and was getting ready to send the manuscript out on submission. It all happened fairly seamlessly and I might have even been foolish enough to think, Hey, this authoring thing is pretty straightforward. What’s the big deal? But I didn’t quite get the happy ending I’d expected. In a nutshell—nobody wanted to publish the book. A dozen or so polite, opaque rejections later (and two poorly written, rushed, and clichéd novels after that) I was unceremoniously dumped by my agent. Washed up at age 25. Having taken my first beating, I did what writers should never do—quit. I threw a little “it’s too hard” tantrum and extinguished the dream of being a published author. For the next five years I focused on journalism. At least by writing about celebrities for weekly gossip mags I could get my byline out there. But even as I climbed the ladder as an editor, I couldn’t shake the gnawing feeling of a lost love. A true passion that I had turned my back on. My confidence was badly bruised from all those knockbacks and at the mere mention of creative writing I closed up like a frightened sea creature. “I’m done with that,” I told people who were brave enough to inquire if I still wrote novels. Secretly, I yearned to write fiction. And without it, I felt incomplete. I just couldn’t find my way back. It took turning 30 to jolt me back into action. I was THIRTY. No longer a twentysomething. It was time to stop sulking over a failed book. I had other stories to write. Other characters to meet. This was my first turning point. I bit the bullet and enrolled in a creative writing course at University. A serious one. One that required me to turn up every week and read my work aloud (terrifying). And also to read other writers’ work (illuminating). It was transformative. I skipped to class, wrote madly, felt my brain fizz with new ideas, smiled, and felt whole again. At the end of my studies I submitted a short story to the university anthology—it was accepted and published in a real book. Reading an excerpt of the story at a bookstore I have never felt so deliriously happy. This was what I wanted to do. Since graduating, it’s the friendships I made in the classroom that have kept me going as a writer. Many of us swapped emails and have met up in pubs, cafes, and Japanese restaurants. We’ve shared our scraps of writing, our insecurities, and struggles. It’s because of them (and knowing I wasn’t alone in wanting to write creatively) that I built up enough confidence to start another novel. YA this time—a darkish tale of an angry Goth girl whose parent’s had sent her away to boarding school. Slowly, tentatively, it took shape. I ran parts of it by my writing buddies. They offered suggestions, encouragement. I kept going. Finally, a few years later, I had a draft of I’ll Tell You Mine. I was holding it pretty close to my chest but when a journalism friend mentioned she knew a senior fiction editor at HarperCollins, I decided now was not the time to be shy and retiring. I asked for the HC editor’s email, made nervous contact, and she agreed to read my manuscript. Maybe this is it! I thought. My second chance. Then a few weeks went by. Then a few months. I didn’t have the guts to inquire if she’d finished it, or liked it. The silence was crushing. When I caught up with my friend at a swish media function, I mentioned (faux casually) if she’d heard from her HC editor mate—had she read my work? The look on her face said it all. It was a horrifying mix of pity and embarrassment. Sitting at a table of journalists over a seafood lunch, she muttered something about it “needing work.” I fled the restaurant and burst into tears standing on a pier on Sydney Harbour. Snot, tears. The works. As horrible and humiliating as that moment was, it was my second turning point. I realised one bad review wasn’t enough to shake me this time. I was going to recover. A fancy editor didn’t like my writing? Yes, it hurt, but she was just one person, in a world of readers. And besides, she wasn’t the teenage girl I was writing the book for. So, I wiped my eyes, put on sunglasses, returned to lunch, and decided to get a second opinion. In fact, I got two. Crucially, both were experienced in the Young Adult market. One was a retired children’s book publisher, the other a rights manager for Allen & Unwin who loved YA. They both read quickly and respectfully and gave me amazing, positive feedback and constructive criticism. They told me not to give up, even in a tough market. And I didn’t. I took their suggestions on board, got together a list of agents, queried, and received a lovely phone call one sunny Monday morning. Sophie Hamley of the Cameron Creswell Agency was on the line. She loved the manuscript and wanted to meet me. This time, it felt like the stars had finally aligned. Sophie and I sat down to coffee (totally clicking on what the book was about and who it was for) and a few months later I was accepting an offer from UQP, a respected publisher of quality YA novels. So, twelve years after I finished my first novel I was signing the dotted line on a book deal. What’s happened since has been a gilded fantasy of copy edits, covers, and breathy press releases—but I will never forget those years chipping away at an idea, mostly alone, hoping that one day it would be a book. And that book would rest in the hands of a teenage girl. Whether or not I’ll Tell You Mine is a commercial success—it was worth it. Pip Harry is a freelance Sydney-based journalist who has worked on Australian magazines for many years, including chasing celebrities as Entertainment Editor for NW and Deputy Editor for TV Week before turning herself into a yoga-loving frequent flyer as Health & Travel Editor for Woman’s Day. She’s the co-founder of relationships website realitychick.com.au and has had short stories published in the UTS Writer’s Anthology and Wet Ink. Pip lives in Sydney with her partner and their gorgeous daughter, Sophie. When not at a keyboard, she can be found searching for the perfect flat white and competing in ocean swimming. Her debut YA novel, I’ll Tell You Mine, was published in Australia on April 2 and is about finding friendship and love in the most unlikely of places, a boarding school. More information can be found at her publisher’s website here or here. 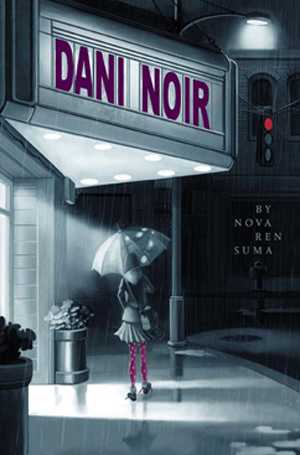 DANI NOIR was published by S&S/Aladdin in 2009. In just two weeks, something I didn’t expect to happen—the paperback release of my first published* novel, Dani Noir—is actually going happen, for real. On June 5 Dani Noir will be released in paperback as… Fade Out! Yes, Dani Noir has gone through a reinvention… a new title, a new cover, new updates to the story, and now a new audience… because the new edition of the book is being released for the YA shelves! I’m so very grateful** the book has this second chance at life! And I’m about to give away two signed copies of the beautiful paperback… so keep reading! How can you enter, you ask? Well, there’s something you should know about this book: The narrator Dani is harboring a bit of an obsession with a famous actress, a true femme fatale in her eyes and the kind of woman she aspires to be: Rita Hayworth, star of noir classics like Gilda and The Lady from Shanghai. So to enter the giveaway, tell me your favorite movie star—and tell me why! * Dani Noir isn’t the first novel I wrote—and it’s not the first novel I published—but it is the first novel I published under my own name! 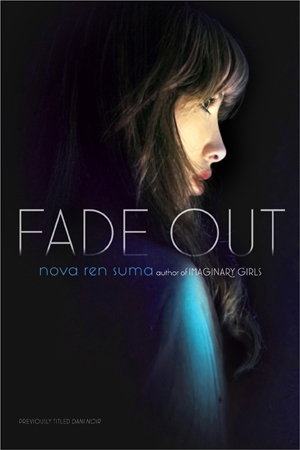 ** Fade Out is all thanks to my Simon Pulse editor, Anica Mrose Rissi, who is truly awesome for believing in Dani Noir enough to give it this chance to find new readers (not to mention the stunning, cinematic new cover). Thank you, Anica! Leave a comment for a chance to win… Who’s your favorite movie star and why? For some reason I thought the only way I would ever become a legitimate writer was by getting an MFA in creative writing. I guess it’s because I didn’t want to get grouped with the many people out there who say they are writers but never write, or write once a year. Just so you know, that’s exactly what I was. But that’s not what I wanted to be. So really, I was looking for a way out of that—something that would force me to become more disciplined and better. I whipped together a portfolio and applied. It’s not that I thought I would definitely get into the program, but . . . I kind of thought I would get into the program. Okay, so I understand why now, but at the time all I could think was, But what about the time I won first place in the fourth-grade creative writing contest? Didn’t that mean something? And what about my first-place win in an eleventh-grade essay contest? Shouldn’t that have somehow secured my admittance to any writing program of my choice? Yeah, I know. Anyway, I read and reread the letter that assured me my writing had “promise” but I would not be admitted into the program at this time. I stuffed the letter somewhere I wouldn’t see it, licked my wounds, and waited for the next application deadline, at which point I applied again. And with a portfolio that was only slightly different than the first one I’d submitted. I was advised to take an upper-level undergrad creative writing class, so I did. And aced it. And applied again. And was rejected . . . again. I stared at that word—promise—again. How in the world was I supposed to tap into this elusive promise if they wouldn’t show me? I let myself wallow in self-pity. Langston Hughes’s poem “Dream Deferred” ran through my mind repeatedly. His lines of a dying dream, of the danger of an unfulfilled dream, left me unsettled, but I convinced myself that I did all I could. I figured some dreams are meant to be deferred and die. It was then that my normally mild-mannered 18-month-old son started having incredible meltdowns. He wouldn’t play with other kids and would scream if we tried to hug or touch him. It was then that he started having severe night terrors and would only be able to soothe himself by tucking himself under mounds of clothes and pillows and blankets, shrieking if I came near him. It was then he started banging his head on his crib, on the floor, on the walls . . .
And we started going to doctors and specialists. He had to have sleep studies, allergy testing, neurological tests, etc. Nobody wanted to diagnose him as autistic because he didn’t quite fit all the criteria, but his behavior was very autistic-like. Finally, he was diagnosed as having Sensory Processing Disorder, speech and language delays, and various food allergies. I stopped teaching so I could take him to his occupational and speech therapies. Our home, our lives, became one huge therapy session. And despite the stress, or most likely because of it, I found myself returning to writing. Because the thing is, dreams like this don’t really die. And as much as I wanted to give it up, I couldn’t. What I did learn from all those rejections was that I had to do something different and it started by finally accepting the truth. I hadn’t really tried. And in some sense, I have to say, I don’t think I knew any better at the time. I didn’t know that to become better, to tap into that promise, you had to write and write and write. All the time. And constantly go back and change and rework and revise. I’d basically been submitting a bunch of horrible first drafts. So, I started taking some online writing courses. I read and reread Stephen King’s On Writing. I read other books on writing. I started reading fiction as a writer, studying what writers do, how stories unfold. I thought, I’ll figure this out. I’ll teach myself. I’ll learn all I can. And write as much as possible. At three years old, my son started school. Not kindergarten, but a pre-K program for children with special needs that he attended five days a week for two and a half hours a day. I worried about his meltdowns, if they would understand him the way I did. He was three and still couldn’t talk. But I had to leave him there for his own good. Two and a half hours seemed so long. For two and a half hours I had to do something that took my mind off of him, that wouldn’t let me sit in the parking lot just waiting for the time to pass. After a couple of parking-lot sessions, I decided to make that time my writing time. Every day, I’d drop off my son and then head to the coffee shop down the street and just write. I missed teaching my high schoolers, and after some false starts, a story started to form about a teen named Charlie who’d been dealt an unfair hand in life. Each day it became more and more, and I actually thought about applying to that program again. But it somehow didn’t seem as important anymore. And it no longer felt like it was the only way to become a writer. Besides I’d learned some stuff, I could tell. Yes, some of what I was writing was bad, but I could see it was bad now. And some was good. I could see that, too. So I kept writing. And I thought, This could be something. And it was: my first novel. Looking back, I guess there were many turning points for me. If I hadn’t been rejected, rejected, and rejected some more, or gone through those hard times with my son (who is doing really well now), or had those two and a half hours each day, I know things would not have worked out the way they did. I know this story never would have been written. Before writing her debut novel, The Downside of Being Charlie, Jenny Torres Sanchez studied English at the University of Central Florida and taught high school for several years in the Orange County school system. Her students were some of the coolest, funniest, strangest, and most eclectic people she’s ever met. She’s grateful to have taught every single one of them and credits them for inspiring her to write YA. Jenny also writes short stories—many of which rooted in her Hispanic culture. She currently writes full-time and lives in Florida with her husband and children. Visit her website at jennytorressanchez.com. Congrats, Gea! Thank you to everyone who entered—and to the author for the prize!